Danny Erb, a math teacher at Pedro Menendez High School, has been chosen as the St. Johns County School District’s (SJCSD) 2018-2019 Teacher of the Year. The announcement was made by Superintendent Mr. Tim Forson at the annual Teacher of the Year and Rookie Teacher of the Year Banquet held on Thursday, January 17 at the Renaissance Resort at World Golf Village. He will go on to compete in the Florida Department of Education-Macy’s Teacher of the Year. Erb has been teaching for 18 years with 4 of those in the SJCSD teaching at Pedro Menendez High School. Prior to his teaching career and following graduation with both a bachelor’s and master’s degree in mechanical engineering from Penn State, he was an engineer with Steam Services and an operations supervisor with Gas and Electric, both in Con Edison of NY, New York, NY. He loves math and helping his students love it too, no matter their level of understanding or ability. He says that teaching them how is easy, and teaching them why is the challenge, though that is his favorite part. Having a background in engineering, Erb enjoys analyzing data though what gets him excited to teach each day is to expose students to new ideas and perspectives. He believes this is how the foundation of respect for learning is laid and love grows from it. When his students leave his class they leave with respect for learning and confidence in their ability to solve problems. Erb never thought he would call another school home after teaching at his alma mater for as long as he had, but this is exactly what he has done at PMHS. He has built relationships and rapport with faculty, students and families. He takes part in every school wide activity to celebrate school spirit and serves as the senior class sponsor. His list of involvement in school activities that extend beyond the campus and school day is endless, and he’s always looking for ways to do more. “It is such an honor to have a teacher of Mr. Erb’s caliber represent our district at the state level,” said Superintendent Tim Forson. He is truly one of a kind and embodies all the traits possessed by great teachers. I am in awe of his ability to not only teach and inspire, but also connect and build lasting, positive relationships with his students. Investing in Kids (INK) produces this celebration with the support of many community and business partners to recognize excellence in the teaching profession. This year featured past Teachers of the Year, Amy Grimm who introduced the evening and Dana Kelley, who performed a special presentation with her students. School Board Chair Kelly Barrera announced the Rookie Teacher of the Year Kristen Meidling who teaches fifth grade at Mill Creek Academy. Middle and high school students and their parents are encouraged to attend the High School Showcase from 3:30-7 p.m. Thursday, January 24 at the World Golf Village Convention Center. Programs of Choice are offered to support a student’s interests, career plans, or advanced academic needs. A student who enrolls in a Program of Choice participates in theme-related classes over a multi-year time period. More than 40 percent of high school students in St. Johns County are enrolled in various Programs of Choice which include Junior ROTC, St. Johns County Center for the Arts, International Baccalaureate and Advanced International Certificate of Education as well as 19 Career Academy options. Students and staff from each high school will be on hand to provide information and answer questions about the Programs of Choice offered at their schools. Information about program requirements and registration will also be available. Any student who meets an individual program’s requirements and who can provide his/her own transportation may be approved to attend any high school, on a “space available” basis. For additional information about SJCSD Programs of Choice, please call the Career and Technical Education Office at 904-547-4870. Mr. Vernon Davis and St. Johns County Commissioner Paul Waldron were honored as the recipients of the 2018 Learning Legacy Lifetime Achievement Awards. These awards are presented annually to former St. Johns County public school students who have returned to the area and dedicated their time and talents to serving their community. A presentation was made to Davis and Waldron by Superintendent Tim Forson on Friday, October 19 prior to kickoff at the football game between St. Augustine and Allen D. Nease high schools. Mr. Vernon Davis graduated from St. Augustine High School (SAHS) in 1960 as a student in its first graduating class. He was also the first starting quarterback ever to play on the SAHS football field. He enjoyed sports and played football, basketball and baseball during his high school career. After graduation he served in the Marine Corps for four years and then earned a degree in building and construction from the University of Florida. He joined the family business, A.D. Davis Construction and served as its president from 1983 to 2004. In this role Davis was a building contractor for several school district construction projects including the Orange Street Administration building renovation and canopy, Crookshank Elementary cafeteria, Murray Middle School roof replacement and St. Augustine High School’s locker room renovation, just to name a few. In 2011 he was inducted into the St. Johns Builders Council Hall of Fame, recognizing his 40-year career in construction. He served on the Pedro Menendez Trade School committee, the St. Augustine Little League Board of Directors, and the St. Johns Builders Council. Davis was a volunteer for Project Swing and the head baseball coach at St. Joseph’s Academy. He and his wife, Donna have three sons, Todd, Michael and Rhett and one daughter, Courtney. They are also blessed with 11 grandchildren. Commissioner Waldron graduated from St. Augustine High School in 1986 where he played golf all four years. He stayed local and attended Flagler College where he earned a bachelor’s degree in business administration. He is an owner and operator of Harry’s Curb Mart and also works in real estate. Waldron served as the assistant girls soccer coach at Pedro Menendez High School for six years and coached youth soccer in the community for 12 years. His involvement in clubs, councils, committees and boards includes the Friends of A1A, Public Safety Council, St. Johns County Cultural Resource Review Board, Juvenile Justice Council, Kiwanis and the Northeast Florida Regional Council Executive Committee. He is the Past President of the St. Augustine Shrine Club, Past Master Ashlar Masonic Lodge number 98 and the past Zone 3 Chairman for youth activities for the Masonic Grand Lodge of Florida. Commissioner Waldron was elected to the St. Johns County Board of County Commissioners to represent District 3 in 2016 and serves as the liaison to the school district. He and his wife, Stephanie, have two daughters, Ashley and Kati. Past recipients of the Learning Legacy Lifetime Achievement Award are former Superintendent of Schools Otis Mason, the late Judge Richard Watson, former Pedro Menendez High School (PMHS) Principal and School Board Member Bill Mignon, Florida School for the Deaf and the Blind teacher-coach Hank White, the late Sheriff Neil Perry, former basketball coach Doris Blackshear, former Representative Doug Wiles, former PMHS football coach Dwaine Fisher, School Board Member Tommy Allen, St. Johns Technical High School and St. Johns Virtual School Principal Cynthia Williams, retired Assistant Superintendent Martha Mickler, CPA Brad Davis, former St. Augustine High School (SAHS) Principal Tyrone Ramsey, former Chamber of Commerce President Robin Burchfield, retired Barnett Bank President Bill Young, former St. Johns County Tobacco Prevention Coordinator Nancy Birchall, Allen D. Nease High School Dean of Students Kelvin “Bernie” Blue, SAHS Yellow Jackets broadcaster Barry Kass, author and board of trustees member for the St. Augustine Historical Society Beth Rogero Bowen, former Alternative Schools Teacher of the Year Rocky Merrill, retired banking executive John W. Daniels, Terrell Hogan attorney Wayne Hogan, Judge Clyde Wolfe, the late SAHS teacher Hattie Jenkins, former-Mayor Len Weeks, retired Director of Risk Management Carol Holtz, Speech-Language Pathologist Katherine Batenhorst, president of The Browning Agency of Ponte Vedra, Inc. Jim Browning, retired teacher and guidance counselor Barbara McClain, Pastor Smiley Sturgis, Dr. Leonard Pellicer, St. Johns Sheriff’s Office Deputy Anthony Coleman, Commander Michele Perry and Ponte Vedra High School Assistant Principal Guy Harris. All recipients’ names are inscribed on a perpetual plaque that hangs outside the Superintendent’s Office. Three individuals were honored as St. Johns County’s 2017-2018 Outstanding School Volunteers of the Year at the 11th annual Outstanding School Volunteer reception held recently at First Coast Technical College. Cheryl Freeman, volunteer coordinator for the St. Johns County School District (SJCSD) served as emcee and Superintendent Tim Forson announced the winners. Rohan Bhargava, a senior at Allen D. Nease High School, is this year’s Outstanding Youth Volunteer. Rohan works tirelessly to ensure that students who need it get food on the weekends by helping pack and deliver Blessings in a Backpack bags at The Webster School. In addition, he created a food pantry there and participated in a back-to-school event to provide school supplies for students in need. Diane Grant, from Creekside High School, is the district’s Outstanding Adult Volunteer. Diane created a welcome program that provides much-needed school information and helpful tips to new families. She has also implemented a student video contest with important topics such as mental health, safe driving, relationship issues, and conflict resolution among others. The contest is followed by a red carpet gala awards night for the winning students. This year’s Outstanding Senior Volunteer is Norm Perkins from Otis Mason Elementary School. Norm has been volunteering for 11 years. He provides 24 hours of service per week in the Physical Education department, and more than 6,600 students have been impacted by him. Behavior referrals during PE are virtually non-existent due to his attentive on-the-spot coaching and support. In addition, the SJCSD Family and Community Involvement Awards were presented to one elementary school and one secondary school for innovative school practices that increase family and community involvement. 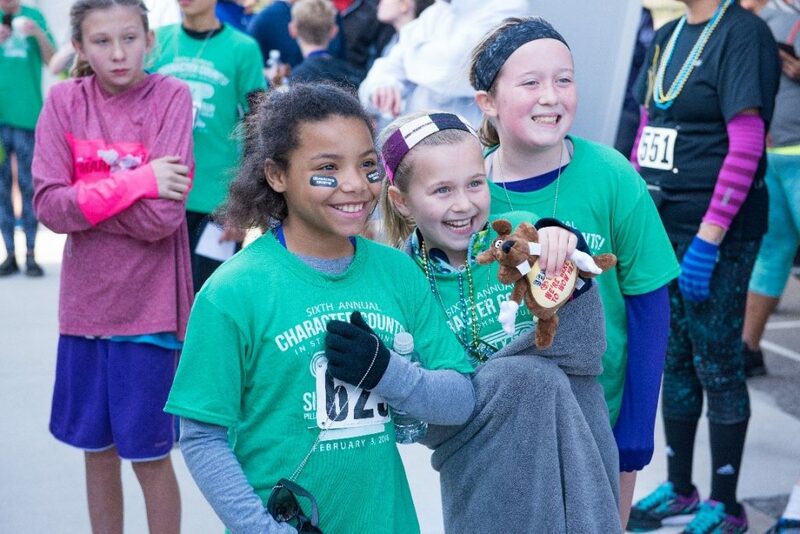 This year’s winners are Hickory Creek Elementary School and Pacetti Bay Middle School. The SJCSD boasts more than 24,200 volunteers who contributed 257,843 hours of service to district schools this past year. 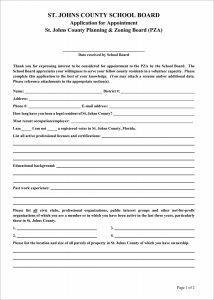 The St. Johns County School District is seeking applicants interested in serving on the St. Johns County Planning and Zoning Agency (PZA). Florida growth management legislation requires all counties to have a School Board appointment as a non-voting member to participate in discussions on rezoning amendments to the land use plan that impact density. The St. Johns County Commission has agreed to go beyond the legislative requirements to make the School Board appointment a full voting member of the PZA. Applicant must be a resident of St. Johns County. Selection will be based on a number of factors including the applicant’s involvement in the county and in public education. Deadline for applications is noon May 18. Each applicant will need to attend the workshop with the School Board Tuesday, June 5 at 8:30 a.m. The School Board plans to make the appointment at its regular monthly meeting Tuesday, June 12 at 9 a.m. Applications may be obtained on the School District website or by calling Judith Harvey, executive secretary for Planning and Government Relations, at 547-7680 or in person at the School Board Administration building at located at 40 Orange Street, St. Augustine, FL 32084. Miriam Testasecca, the executive secretary for the School Board of the St. Johns County School District (SJCSD), has been named the SJCSD 2018 School-Related Employee of the Year (SREY). Her selection was announced by Superintendent Mr. Tim Forson at last week’s SREY reception held March 15 at the World Golf Hall of Fame Museum. Testasecca was selected from 44 nominees for her exemplary job performance, dedication, interpersonal skills, leadership ability, training and contributions to the SJCSD and the community. Testasecca has been employed as the School Board’s executive secretary for six years and has 17 years overall with the school district. She is a dedicated and efficient professional who serves all five board members with varied requirements and expectations. Her excellent organizational skills enable her to handle multiple tasks of differing levels of complexity. Her welcoming demeanor and service attitude are characteristic of her encounters with the general public. She is also the bookkeeper for 19 internal district accounts and prides herself on the attention to detail to avoid deficiencies and errors. She has never had a deficiency noted in an audit of those accounts. In addition, she has been mentoring two students for the past four years and also is the district office Wellness Coordinator. She has volunteered her time to run exercise and weight loss programs for district employees and is active with fundraising projects for the district’s ASSIST program and The Shriner’s Hospital for Children. Testasecca’s name and information packet has been forwarded to the Florida Department of Education as SJCSD’s representative and for consideration as the SREY representative at the state level. The St. Johns County School District (SJCSD) will hold early registration for children entering kindergarten for the 2018-2019 school year. Tuesday, March 13 9 a.m. – 1 p.m. Wednesday, April 4 1 p.m. – 5 p.m.
Tuesday, March 20 9 a.m. – 1 p.m. Wednesday, April 11 1 p.m. – 5 p.m.
Parents must register children at the school where they are zoned for the 2018-2019 school year. To find your school, enter your street address on the Attendance Zone Locator at www.stjohns.k12.fl.us/zoning/. Students zoned for the new K – 8 School “KK” will need to register at Allen D. Nease High School, located at 10550 Ray Rd., Ponte Vedra and students zoned for the new K- 8 School “LL” will need to register at the Aberdeen Community Center, located at 110 Flower of Scotland Ave., St. Johns. For additional information on registration and zoning, visit www.stjohns.k12.fl.us/student/enrollment/ or contact the Student Services Department at 547-7598.